One of Dundee's most famous sons. The foundation of the Albert Institute of Literature, Science and Art is in great part due to his liberality and to the forceful way in which he drove the project to fruition. Subscriber no. 18 – Edward Baxter Esq. of Kincaldrum was his brother. Subscriber no. 35 – W.E. Baxter Esq., M.P. Ashcliffe was his nephew. Subscriber no. 4 – George Armitstead Esq. was his niece’s husband. Subscriber no.68 – W.O. Dalgleish Esq. worked for Baxter Brothers & Co and was one of Sir David’s executors. Subscriber no.55 – Peter Carmichael Esq. was a partner in Baxter Brothers & Co and was one of Sir David’s executors. David Baxter was the son of Elizabeth (Betty) Gorrell (1763-1804) and William Baxter (1767-1854). William and Betty had eight children: Eleanor (1788-1868), Edward (1791-1871), Margaret (1794-1845), David (1793-1872), John Gorrell (1796-1853), William Gorrell (1798-1852), Mary Ann (1801-1884), and Elizabeth (1802-1883). David's father had erected a flax and tow yarn spinning mill on the Glamis Burn about 1806. 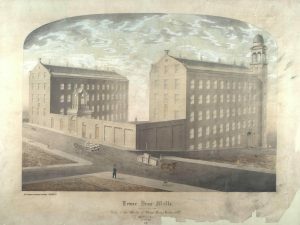 In 1822 William and his eldest son, Edward, erected a spinning mill at Lower Dens, operating as William Baxter and Son. In 1825 the firm of Baxter Brothers & Co was founded, taking in William's younger sons, John and William. About this time Edward left the business to set up his own firm. 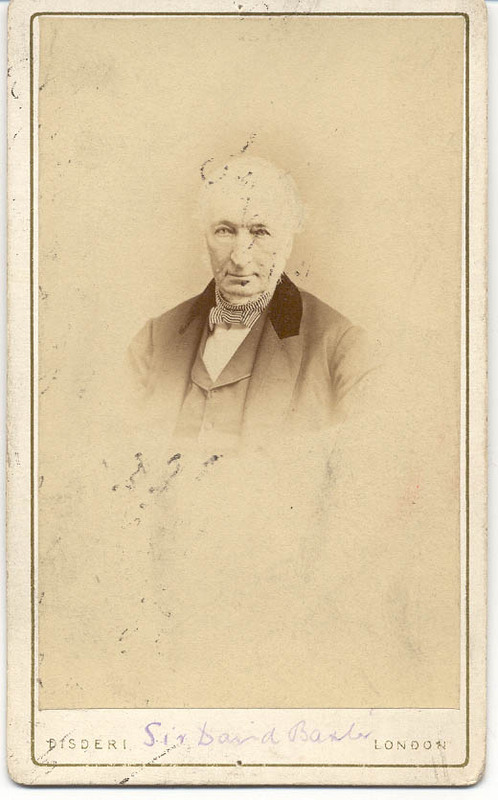 David served on the Police Board, 1825-1826 and as a Guild Councillor on the Police Board again, 1827-1829. His brothers, Edward, William and John also served on the Police Board at various times. 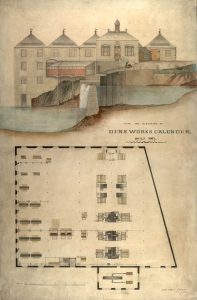 In 1833 the Upper Dens Works were erected. David had become manager of the Dundee Sugar Refining Company at an early age but the business was not a success and by 1837 David has thrown in his lot with his brothers, John and William, in Baxter Brothers & Co, merchants and flaxspinners. He is still in the local directory as manager of the Sugar Refining Co in the Seagate in 1834 but by 1837, he is recorded as a Cowgate merchant. David lived with his widowed father, sisters and younger brothers at Ellangowan until his marriage to Eliza Montgomerie in 1833. The newly-weds moved to Craigie House. The firm of Baxter Brothers & Co made early attempts to introduce power loom weaving, but these were unsuccessful until 1836. Peter Carmichael was the manager of these works and it was David Baxter's suggestion that he be taken into the firm. In 1842 the firm also introduced the practice of one weaver operating two power looms, overcoming opposition from the workers to do so. 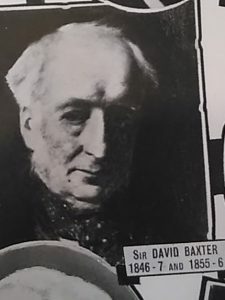 In 1841 David Baxter supported the candidacy of J B Smith, President of the Anti-Corn Law League against against George Duncan but saw his choice fail to be elected as MP. He later graciously acknowledged the contribution Duncan made to the town as its MP. In the 1840s, Baxter Brothers ran a regular sailing between Dundee and Dunkirk and owned a couple of schooners for the purpose. Later the firm also owned two brigantines. David Baxter also a owned a number of ships in his own name. He had been a Harbour Trustee, representing the Guildry of Dundee, as early as 1829. He subsequently served on the committee of subscribers for the improvement of the pilotage of the River Tay and harbour of Dundee, becoming its chairman in 1856. He was also elected to the Local Marine Board by "the owners of foreign-going ships". His and the firm's ownership of vessels seems to have ceased by the mid-1850s. In about 1846 David had moved to Union Mount, Perth Road, (a villa probably designed by David Neave in 1808 and now a part of the University of Dundee). David's father and two younger brothers all died between 1852 and 1854, leaving him as the main proprietor of the business, along with his partner, Peter Carmichael. His older brother, Edward, had a business as a merchant in his own right and would soon take his son into partnership, as Edward Baxter & Son. Baxter Brothers & Co continued to specialise in linen and for some years they had supplied cloth to Haywards of Crewkerne, who made them into sails for the navy. In 1855, by painstaking attention to quality, Baxter Brothers & Co were able to overcome the Admiralty's prejudice against power-loom cloth and secured a direct order. These and other government contracts helped secure the financial position of the firm, thereby contributing greatly to the prosperity of Dundee. The mechanical skill of Peter Carmichael greatly facilitated the growth of the company and allied to the business capacity of David the firm became one of the largest manufacturing houses in the world. 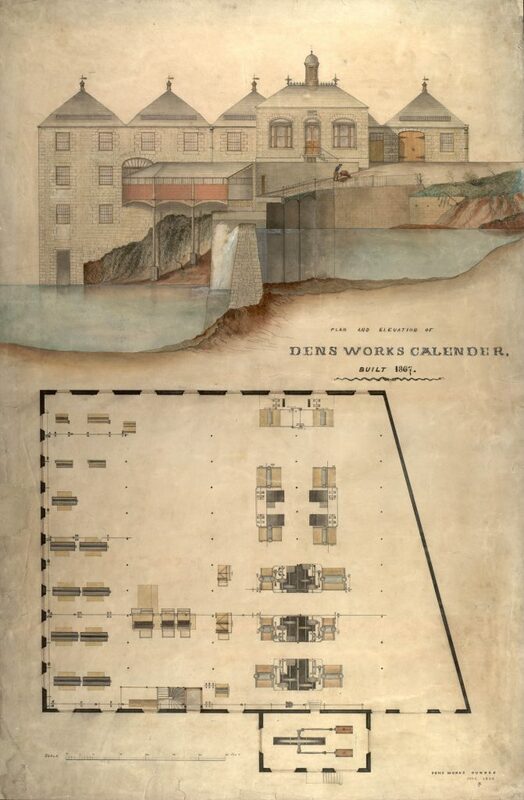 The Lower Dens Works and Upper Dens Mills either side of Princes Street dominated the area and boasted Italianate campaniles and Egyptian obelisk chimneys At its peak in the 1860s, the Dens employed 4,500 people. 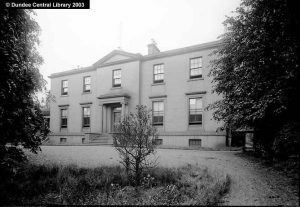 In 1856 David purchased the estate of Kilmaron, near Cupar in Fife, but he still concerned himself in Dundee's affairs, serving on the parochial board, continuing as a director of the Dundee Gas Light Co and acting as president of the Chamber of Commerce. His major claim to be remembered in Dundee came in the shape of Baxter Park, which he and his sisters gifted to the city after employing Sir Joseph Paxton to advise on layout of the 38 acre site. He was granted a baronetcy on 1 January 1863, partly in recognition of his great business success but also due to his great gift to the people of Dundee which was then taking shape. 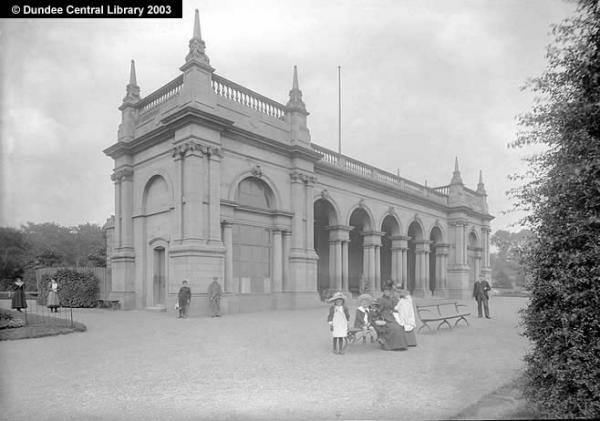 The park opened to the public in September 1863 and the Renaissance pavilion contained a niche for his statue executed in marble by Sir John Steell. It is believed that his sisters turned down the opportunity of being similarly immortalised. 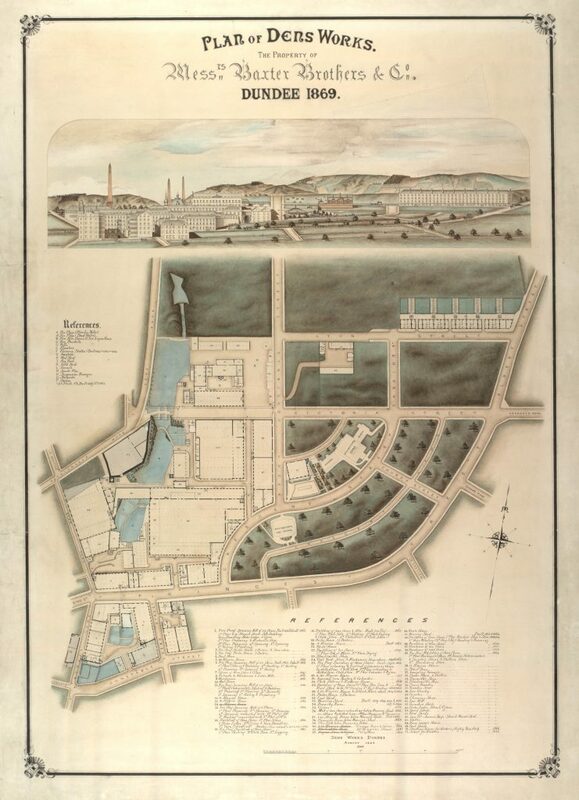 It was reported later that "Sir David gave as the reason why he proposed that their gift should take this substantial form that the growth of Dundee was rapidly encroaching on the pleasure grounds on which the townspeople had been accustomed to recreate themselves and he and his sisters desired to give to the town a pleasure ground of which it could not be deprived, and where the labouring population of Dundee might breathe freely." The statue of Sir David was provided by 16,731 subscribers "in grateful acknowledgment of the gift of this park to the people of Dundee by him and his sisters, Miss Eleanor and Miss Mary Ann Baxter; and in affectionate remembrance of their late father, William Baxter, Esq. of Balgavies, they desire that his name be associated with the gift." The other main reason he should be remembered with much gratitude in Dundee is his key role in bringing the Albert Institute into existence. In the latter end of 1863, by which time he had taken up a further residence at 5 Moray Place, Edinburgh in addition to Kilmaron Castle and a Dundee property at 13 King Street, "he took a leading part in promoting the erection of the Albert Institute buildings and securing the large open space that surrounds the buildings and makes the Albert Square one of the very rare spots of beauty in crowded Dundee." At a time when the Town Council was wavering in its support for the creation of the Institute on the Meadows site Sir David exerted himself to achieve the desired outcome and "the subscribers to the Albert Institute cannot too highly appreciate the great personal interest and exertions of their Chairman, Sir David Baxter, in carrying through the difficult and delicate negotiations which have been pending during the last few weeks, and especially during the last few days. On two or three several occasions the hon. baronet has left Edinburgh for Dundee by the first morning train, to attend the committee meetings, and to one of his years, and at this inclement season of the year, such a sacrifice of comfort and time indicates even more strongly than his open-handed contributions how anxious he is for the success of this important undertaking." Having initially subscribed £1000, a figure matched by his brother, Edward, he eventually committed £4000 to the project. Sir David did not neglect Baxter Park, acting as one of its trustees and also becoming patron of the Dundee Horticultural Society. 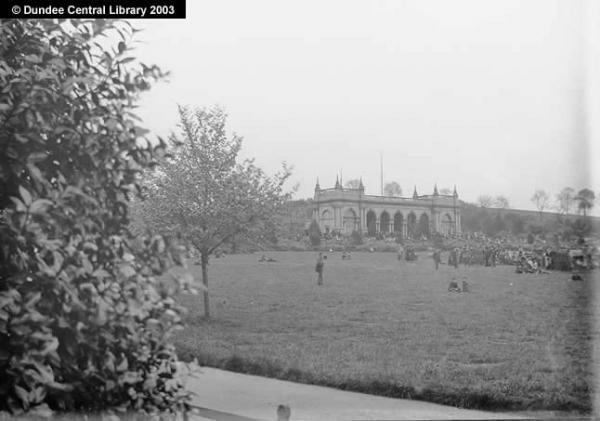 Baxter Park was where a Grand Floral Fete was held. He also served as a director of the Albert Institute Ltd and acted as Vice-President of the committee organising the visit to Dundee of the British Association for the Advancement of Science, entertaining a large party of the distinguished visitors in a large marquee erected in the grounds of Kilmaron Castle. He continued to lend his support to worthwhile causes. He joined his brother, Edward, as a Vice-President of the Dundee Industrial Schools Society and joined the local committee of the Dundee Branch of the Royal National Lifeboat Institution. He also subscribed £10,000 for a convalescent hospital for Dundee. In the educational sphere he founded the Baxter Institution for Female Education in Cupar, a forerunner of that town’s Bell Baxter School. He also endowed a chair in engineering and scholarships in mathematics, philosophy and natural science at the University of Edinburgh. Even in the last year of his life, when his health was beginning to fail, he took on further responsibilities by becoming a patron of the Mars training ship and also acting as a trustee of the National Guarantee and Suretyship Association Ltd. Although Sir David’s funeral took place in Cupar and he was buried in that town the event was marked with great solemnity in Dundee. The Baxter Brothers works were stopped between 1.00 and 3.00 pm, flags were flown at half mast on all the public buildings and at many private residences, the ships in the harbour also put their flags at half mast and the town’s bells were tolled for an hour. His heritable and personal property was valued at £1,200,000. He left £40,000 to Edinburgh University; £55,000 to various branches of the Free Church of Scotland, plus £7,500 to the Free Church in Cupar of which he was a member and £20,000 for the erection of a mechanics’ institute in Dundee. Lady Baxter died at Kilmaron on 11 September 1882, aged 81. Sir David’s nephew, W E Baxter inherited Kilmaron Castle. Scotland, Select Births and Baptisms, 1564-1950. FHL Film Number 993424. Ancestry website. Old Parish Record. Dundee. Baptism. 24 March 1793. 282/70 537. Scotlands People website. Scotland, Select Marriages, 1561-1910. FHL Film Number 993404./Old Parish Record. Dundee. Marriage. 22 April 1833. 282/220 112. Scotlands People website. Dundee Directories, 1834-1845. Local Studies, Central Library, Dundee. Dundee Directories, 1846-1857. Local Studies, Central Library, Dundee and McKean, Charles and Walker, David. (1985) Dundee - An Illustrated Introduction. Edinburgh: The Royal Incorporation of Architects in Scotland and Scottish Academic Press. p.63. Local Studies, Central Library, Dundee. Dundee Directories, 1857-1872. Local Studies, Central Library, Dundee and Henderson, T.F., revised by McConnell, Anita. (2004) Baxter, Sir David, baronet (bap. 1793, d. 1872). Oxford Dictionary of National Biography website. Fife Herald, 24 October 1872. British Newspaper Archive website. (See also member's photograph. Ancestry website). Henderson, T.F., revised by McConnell, Anita. (2004) Baxter, Sir David, baronet (bap. 1793, d. 1872). Oxford Dictionary of National Biography website and Dundee Obituary Book, No 1, 1869-1894. Funeral sermon by Rev John Laird, Cupar Free Church. p52. Local Studies, Central Library, Dundee. Dundee Directories, 1834-1868. Local Studies, Central Library, Dundee. Henderson, T.F., revised by McConnell, Anita. (2004) Baxter, Sir David, baronet (bap. 1793, d. 1872). Oxford Dictionary of National Biography website and Dundee Police Board Minutes, 1824-1832. Dundee City Archives. Dundee Directory, 1864-65. Local Studies, Central Library, Dundee and Henderson, T.F., revised by McConnell, Anita. (2004) Baxter, Sir David, baronet (bap. 1793, d. 1872). Oxford Dictionary of National Biography website. Dundee Directories, 1846-1850 Local Studies, Central Library, Dundee. Dundee Directories, 1842-1872. Local Studies, Central Library, Dundee. Dundee Directories, 1824-1834. Local Studies, Central Library, Dundee and Henderson, T.F., revised by McConnell, Anita. (2004) Baxter, Sir David, baronet (bap. 1793, d. 1872). Oxford Dictionary of National Biography website. Dundee Directories, 1850-1868.Local Studies, Central Library, Dundee. Walker, William M. (1979) Juteopolis - Dundee and its textile workers. Edinburgh: Scottish Academic Press. pp.35-36. Local Studies, Central Library, Dundee. Dundee Directories, 1842-1847. Local Studies, Central Library, Dundee. (Hawk, built 1838, 84 tons and William, built 1839, 119 tons). Dundee Directories, 1846-1854. Local Studies, Central Library, Dundee. (Jules built 1844, 109 tons and Helena, built 1849, 292 tons). Dundee Directories, 1846-1854. Local Studies, Central Library, Dundee. (Brechin Castle, brigantine, built 1844, 371 tons; Ellangowan, brigantine, built 1843, 207 tons; Glammis Castle, brigantine, built 1842, 342 tons; Hawk, schooner, built 1838, 84 tons and William, schooner, built 1839, 119 tons). Lenman, Bruce; Lythe, Charlotte and Gauldie, Enid. (1969) Dundee and its Textile Industry, 1850-1914. Dundee: Abertay Historical Society. p.25. University of Dundee Archive Services. McKean, Charles and Whatley, Patricia with Baxter, Kenneth. (2008) Lost Dundee - Dundee's Lost Architectural Heritage. 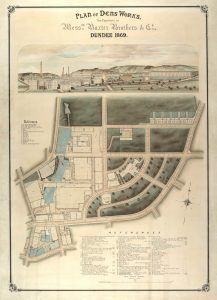 Edinburgh: Birlinn Ltd. pp.114-117. Dundee Obituary Book no. 1, 1869-1894. Death of Miss Baxter. p.17. Local Studies, Central Library, Dundee. Dundee Advertiser, 2 February 1864. British Newspaper Archive website. Dundee People's Journal, 19 October 1872. Death of Sir David Baxter. British Newspaper Archive website. Dundee Directories, 1867-1872. Local Studies, Central Library, Dundee. Fife Herald, 24 October 1872. British Newspaper Archive website. Dundee Courier, 2 October 1872. British Newspaper Archive website. Dundee Obituary Book no. 1, 1869-1894. Death of Miss Baxter. p.18. Local Studies, Central Library, Dundee. Many thanks to the staffs at the University of Dundee Archives Service; Local Studies, Central Library, Dundee; Dundee City Archives; Perth & Kinross Archives and Local & Family History, A K Bell Library, Perth. The information above about David Baxter of Kilmaron has been collated from a range of digital and hard copy sources. To the best of our knowledge it is correct but if you are relying on any information from our website for the purpose of your own research we would advise you to follow up the sources to your own satisfaction. If you are aware of an inaccuracy in our text please do not hesitate to notify us through our Contact page.